Advanced skippering techniques for yachtsmen and women with considerable knowledge of sailing and navigation, wanting to undertake longer coastal passages by day and night. 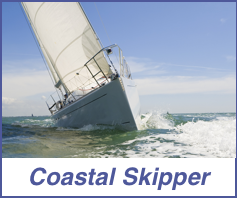 Like the Day Skipper course, this course consists of skippered passages in a variety of situations but concentrates on night cruising and handling heavy weather. Passage planning for longer passages, Preparation for sea, Pilotage, Passage making and ability as skipper, advanced yacht handling under power, advanced yacht handling under sail, tide, adverse weather conditions, night sailing and watchkeeping, emergency situations. Ability after the course: Able to skipper a yacht on longer coastal passages by day and night. Certificate awarded at end of course: RYA Coastal Skipper (Sail).